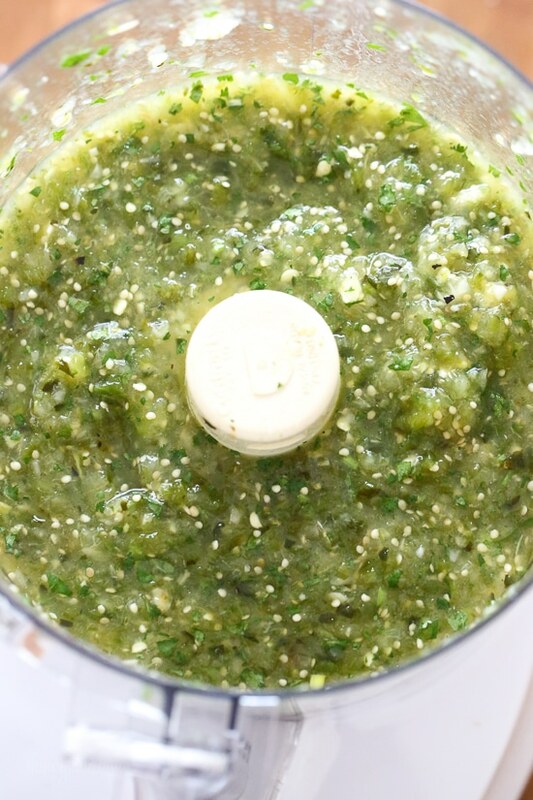 Salsa Verde is a fresh, healthy salsa made with roasted tomatillos, peppers, garlic, onion and cilantro. Perfect for dipping your tortilla chips into or used in recipes that call for jarred Salsa Verde. Great for any party appetizer and Cinco de Mayo! Other salsa recipes I also enjoy are Easy No-Cook Restaurant-Style Salsa, Shrimp Salsa and Pico de Gallo Salsa. Yes, it’s easier to buy it jarred, but trust me, it tastes SO much better made from scratch and it takes under 30 minutes. I’ve been making this salsa verde recipe from BHG for the past few years, it has been my go-to since first trying it. Roasting intensifies the flavor of the tomatillos and peppers, which adds another dimension of flavor to the salsa and I love that no oil is added. 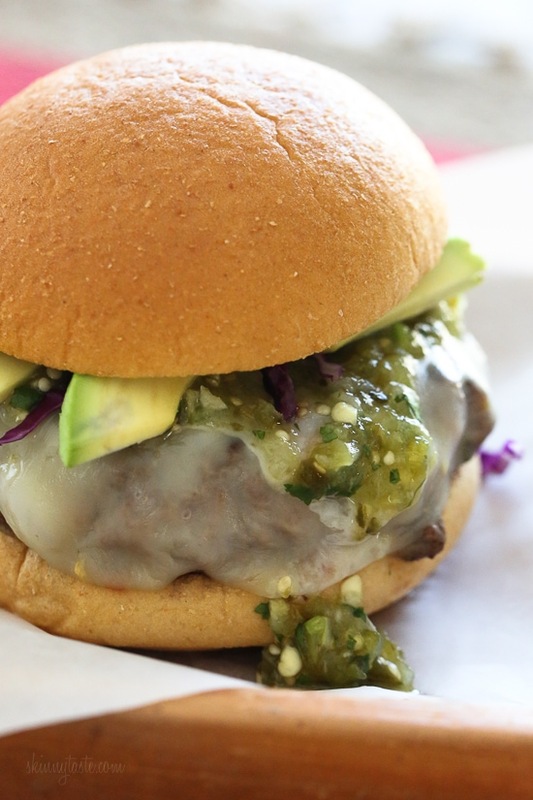 This recipe can be doubled or tripled as needed, try it over Salsa Verde Burgers, Enchiladas Verdes, Slow Cooker Salsa Verde Chicken, or just grab some chips! This looks amazing!! Will be putting the tomatillos, cilantro and poblano on my grocery list. 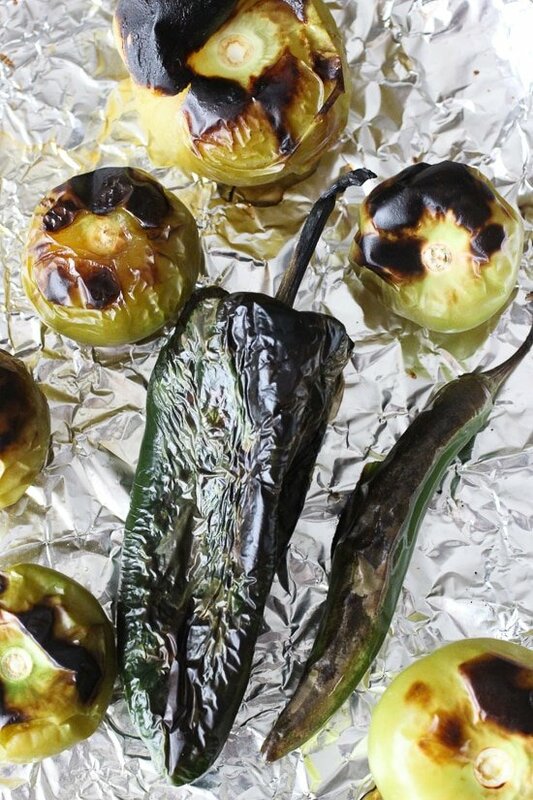 Has anyone ever roasted the tomatillos, onion and peppers on a gas grill? Last year we were in California and I had salsa verde enchiladas and the sauce seemed like it had a small amount of cream in it. Has anyone ever put a bit of cream in their salsa verde? 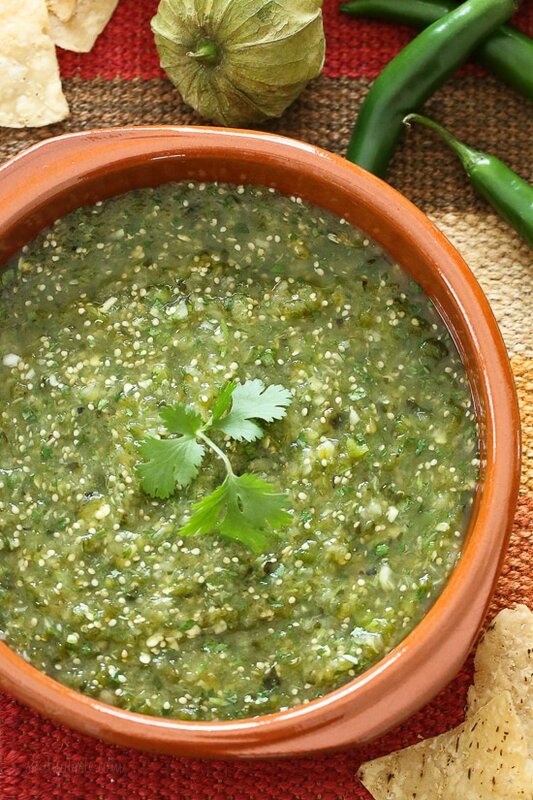 This is the best salsa verde. I make 13 batches at a time and can it! Made it without the hot chili for the kids. It was delicious!! Amazing dishes and amazing food! I would love to try and make this for everyone at work! Extraordinary! My guest asked for more food, just so could eat more sauce! Wow! I’m seriously super impressed with this recipe. Making it for the salsa verde chicken enchiladas. I will never buy salsa verde prepared again because nothing compares. 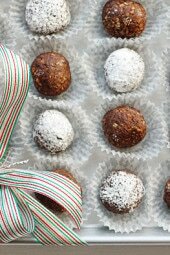 Super easy to make and will go great with EVERYTHING…Skinny and Not. I cannot wait to make potatoe and egg tacos this weekend. This stuff is officially jarred and ready to go…. I am currently doing the whole 30 diet, can I leave out the sugar or is it necessary? Thanks! This is the best salsa verde I have ever had. I have made this recipe numerous times and I have to double it because my family fights over it! Thanks Gina! Salsa Verde is a staple in my kitchen. Great recipe here. Will try it out tonight. Can the sugar be left out of the recipe and spoil the taste? We are a diabetic family. Thans for a great recipe!! Great, easy recipe that goes well with pretty much anything. It’s great on chicken, turkey, eggs, roasted vegetables, tofu, steak, eaten with a spoon standing at the fridge 😀 — I have yet to find something (reasonable 🙂 that it does not go well with. The only change I make to it is roast all the vegetables, including the garlic and onion. I also tend to increase the amount of onion and garlic, depending on what I need to use up and what we feel like having that week. You can roast the garlic in or out of the peel/skin but since I hate peeling garlic (mental block thing, I guess) I usually just leave it and squeeze it out of the skin (as I think someone else previously mentioned, too) after it’s roasted and charred. If you’re a fan of green peppers you can also add 1/4 to a 1/2 of that (maybe replace the jalapeno/serrano with it if you don’t like ANY heat). Thanks for another great recipe. I have a bunch that I have tried and a bunch that I still want to try but all so far have been easy and wonderful. Since both of us here had gastric bypass surgery the recipes as written also make meals for multiple lunches and dinners (including freezing some, too, for later use, such as the picadillo) which is a definite plus, too. Lastly, I love that you include directions for stove/oven as well as crock pot and InstaPot (?) when applicable. It makes it VERY easy for those of us who, for instance, have a crock pot but not an InstaPot. I have always wanted to try this. When are tomatillos in season and how do you tell if they are ripe? I have made this salsa every week for the last 5-6 weeks or so. I go through a batch per week and I can’t get tired of it. I mix it with chicken and make chicken tacos every single day for lunch. I love all of your recipes and I’m such a fan girl. But seriously, this salsa is great! This is amazing! Made a double batch tonight, because we are salsa fiends around here. Had to use jalapeño instead of serrano and the heat was great. Thanks for sharing this gem!!! Oh and make sure you move your top oven rack up closer to the broiler…I started off with mine too low and the veggies weren’t roasting quickly. Can I leave the sugar out Gina? You know I love you & Skinnytaste so much from all my comments over the years! thanks! Yes, but it balances the tartness of the tomatillo. I make this in my blender because I don’t have a food processor . Use it for salsa verde enchiladas. My boyfriend loves you so much for posting this. I am going to make this all the time now! Making the crock pot chicken tonight for tacos and having the leftover salsa with um.. everything! Mostly egg scrambles. Thank you, who knew this was so easy and quick! I love the roasted flavors you get. In addition to roasting everything you recommended, I roasted the garlic too. You can do this a number of ways-preferably I like to roast it leaving the unpeeled head of garlic or a few cloves still in their skins on a hot pan, turning every few minutes. Your garlic gets soft and the flavor boost is awesome. Thanks for sharing! Gina, I know you have been converting all your recipes over to SmartPoints – can you please convert the Salsa Verde Burgers? I would love to make this for my family this weekend. Thanks so much. I’ve been making a different version of this for years now. I love the addition of the poblano. I am going to try that this weekend. Thank you! If I double the batch, how long will it last in the refrigerator? Great!! It should last a week at least. How spicy is this? I’m making this for guests that can’t have spicy food. The Serrano is spicy, for milder use jalalpeno and take the seeds out. Can you just do two pablanos instead? Looks awesome and much lower sodium! Thank you for all your work, my family and I appreciate it! Yum! I always boil my tomatillas, now I’ll have to try roasting! My favorite way to use this salsa is over scrambled eggs, or mixed with a mashed avocado. If I use jalapeno instead, do I have to peel it? Hi, any suggestions or tips on how to easily peel off the skin? I have tried with the poblano peppers and usually end up tearing the pepper! Putting it in foil or a ziplock bag 10 min makes it come off easy. Hi Gina, Do you think I could freeze this? I know it won’t have that fresh taste, but the recipe is too large for us otherwise. How long can this salsa be stored (refrigerated of course) before it spoils? My guess is 5 to 6 days? You can freeze salsa’s too! I make big batches and pull out when the Boys bring friends over! In my home we add a tiny splash of white vinegar right before storing in the fridge, greatly increases it’s shelf life. Hmmm…lime would be lovely with the same result..do you think? Aaaaaaah thank you thank you thank you! I have been using a similar method of preparing my sauce based on one from Sunny Anderson at foodnetwork. It is very similar to yours. In addition to the flavor, roasting makes everything more bendable! 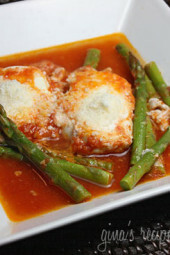 I have tried many other methods of preparing this sauce, this is hands down the best! Love your blog! Love your recipes! Thank you! 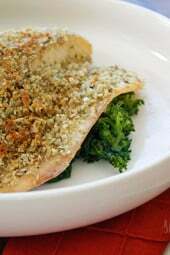 Hi Gina – Love all of your recipes, my husband and I are a Skinnytaste household! Do you have a substitute for the cilantro (parsley maybe) or would it be ok to leave it out? Thanks! I would leave it out.